Indian Acalyphat is traditionally used for treating intestinal worms, gum problems, stomach aches, rheumatism, bronchitis, asthma, scabies and skin diseases. 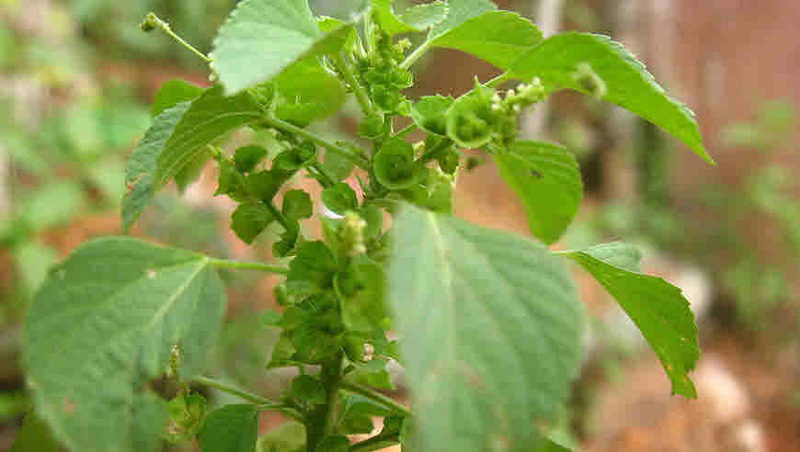 Indian acalypha is medicinal herb which is found in India, Pakistan, Sri Lanka, Yemen and Africa. It grows as weed in waste areas, garden and along roadsides. Studies have proven its antibacterial activity against several gram positive bacteria. In lab experiments on albino rates it shows reversible anti-implantation activity due to some oestrogenic activity. Its ethanol leaf extract possess potent snake venom neutralizing properties. It has marked action on digestive system and respiratory organs. In India as well as Africa, it is used as medicinal plant. In West Africa the leaves are cooked and eaten as vegetable. In traditional Tamil Siddha it is believed to rejuvenate the body. Indian acalypha is also eaten by cats to cure constipation and indigestion. The cats search for this plant and chew its leaves and roots. The plant of Indian acalypha reportedly possesses diuretic, purgative, anti-bacterial, antifungal, and anthelmintic properties. This medicinal plant is traditionally used for treating intestinal worms, gum problems, stomach aches, hernia, rheumatism, bronchitis, asthma, pneumonia, scabies and skin diseases. It can be used externally and internally for medicinal purpose. Botanical name: Acalypha indica Linn. Soak few leaves in water for a few hours. Filter and take this water in a dose of 2 teaspoonful. Do not take in excess as this can cause vomiting. Take fresh leaves of the plant. Wash well and dry completely. Pulverise to prepare powder. Take this powder (¼ to ½ teaspoon) with lukewarm water. Take clean leaves and grind with few garlic pods. Take this with rice. Prepare fine powder of Indian-acalypha and Tulsi leaves (Ocimum sanctum) in equal amounts. Take this powder (2-3 pinches) with little amount of ghee thrice a day. Take fresh leaves of Indian acalypha and prepare a paste. Apply this paste on the affected areas. Grind handful leaves of Indian-acalypha. Add salt (1 teaspoon) in this paste. Externally apply on skin disorders. Apply leaves juice on the affected areas. Prepare Indian-acalypha medicated oil. For this purpose extract leaves juice of this medicinal herb. Add this juice in equal amount of sesame oil. Cook this oil, till all water evaporates and only oil remains. Apply thus prepared medicated oil in lukewarm condition. Dry leaves of Indian acalypha in sun and prepare a powder. Apply this powder on the affected areas to get relief from bed sores. Prepare a poultice of its leaves and apply at affected areas. Prepare fine paste of its leaves and apply on the affected areas. Mix its leaves paste with haldi (turmeric) and apply at affected area. This plant is absolutely safe for external application. For internal use it should be not be used in excess as that can cause intestinal irritation and vomiting.